This memorial would also cover the adjoining village of Donnington which is part of the same parish and does not have its own memorial. 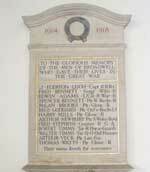 To the glorious memory of the men of Broadwell who gave their lives in the Great War. Edward Egerton Leigh lieutenant Queens Bays of Broadwell Manor House, July 1 1851 - June 25 1913.